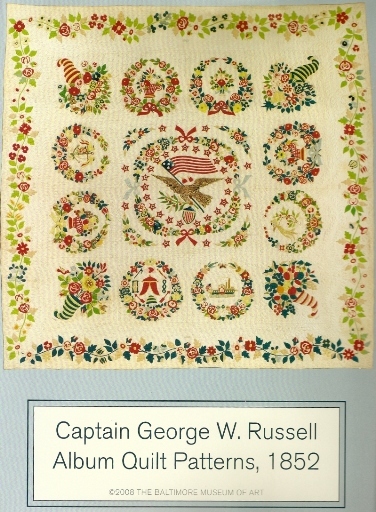 Margo Cramer, Eleanor Layman and Marylou McDonald reproduced the patterns for the Captain Russell Quilt for the Baltimore Museum of Art to sell with the proceeds going to the museum's textile collection. The pattern set includes all 13 blocks, 4 borders, a CD-ROM of pictures for each block and a color code chart. For more information or to purchase the pattern set from the BMA at: Captain Russell Pattern or call the BMA shop at 443-573-1844.